Even though depression can strike virtually anyone, there are some circumstances and events that can predispose a person to depression. One of the most important but often ignored aspects of this debilitating condition is that depression is too often only treated and rarely prevented. There is some attention given to preventing recurrence of depression but one school of thought is that we should be researching better ways to identify those at risk of depression. On top of that, putting appropriate support and intervention systems in place for those identified at high risk could mean the difference between life and death for someone. Been the victim of a sexual assault? A family member who suffers from depression? Suffering from a serious illness that severely affects quality of life? 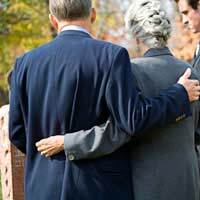 Recently lost someone you love? Painful childhood abuse or experiences? Also, women tend to experience depression significantly more frequently than men but this may be due, in part, to the fact that more women seek treatment for depression than men. Women may also suffer from postpartum depression, which occurs after giving birth. People on a very low-income in the poverty bracket are also more likely to struggle with finances and may suffer from depression as a result. Some personality traits and issues can contribute to the development of depression. These include having poor self-esteem and being intensely critical of oneself. Although you can't control for some factors such as your genetics, you can still take action to prevent depression. This is particularly important if you are at a high risk of experiencing depression. Research suggests that having a solid support system in place is important to help prevent depression. Those who have strong social networks and consistent relationships with family and friends are less likely to feel socially isolated, which can increase the risk of depression. A healthy lifestyle that includes eating a wide variety of nutritious foods, getting regular exercise and avoiding drugs or excessive alcohol also helps reduce your risk of depression. Exercise can make a real difference when it comes to supporting positive moods and improving self-esteem. It also helps to have a strong sense of self and the ability to recognise and deal with things when they go wrong. Depression that occurs after a life-changing event, for instance, may better have been prevented if that person recognised their sadness and sought help early on. The ability to identify your feelings and deal with them is important to helping you enjoy life without depression. Nobody is immune to depression and it will strike many people in their lifetime. But by checking off the risk factors you have now, you will better be able to deal with each risk before it potentially leads to depression.